spur is worn in pairs on the heels of riding boots for directing a horse to move forward or laterally while riding. It is usually used to refine the riding aids (commands) and to back up the natural aids (the leg, seat, hands and voice). 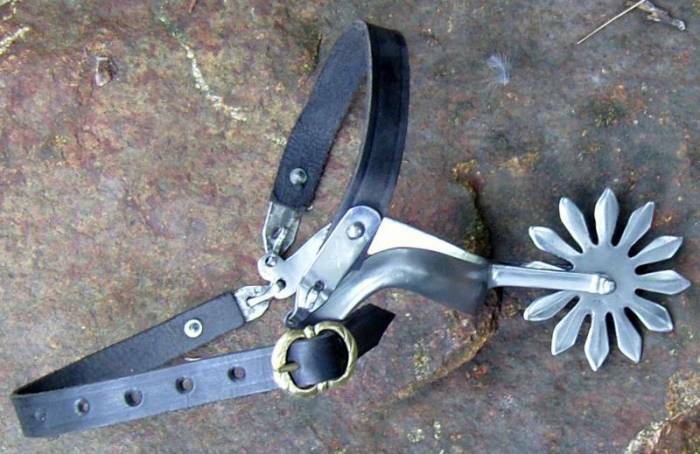 This Churburg style spur has a U-shaped heel band with a large rowel attached to the shank and has leather straps for fastening it around the boots.It is completely wearable and can be used for costume dressing.